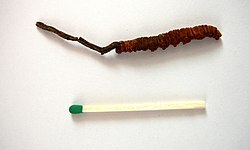 ^ Ophiocordyceps sinensis (Berk.) G.H. Sung, J.M. Sung, Hywel-Jones & Spatafora 2007. MycoBank. 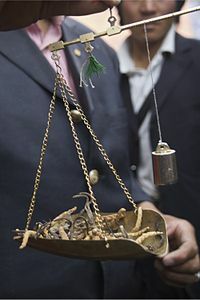 International Mycological Association. [2011-07-19]. ^ Sung, G. H., et al. (2007). "A multi-gene phylogeny of Clavicipitaceae (Ascomycota, Fungi): identification of localized incongruence using a combinational bootstrap approach." Molecular Phylogenetics and Evolution 44(3): 1204-1223. ^ 信息中心. 总局关于停止冬虫夏草用于保健食品试点工作的通知食药监食监三〔2016〕21号. 青海省食品药品监督管理局. [2018-05-26]. ^ chinanews. 食药监总局：长期食用冬虫夏草存在较高风险-中新网. 中新网. [2018-05-26]. ^ 12.0 12.1 程莉. 起底冬虫夏草：一个“中国式”大骗局的始终. 財新網. 2016-04-12 [2017-11-14] （中文（简体）‎）.